Updated 6:40 p.m. PT with evacuees being allowed back. Authorities are permitting the return of many of the 20,000 residents who were ordered to evacuate areas threatened by the Sand Fire north of Los Angeles. "At 7:00 pm, ALL residents in ALL evacuated areas will be allowed to return home, with the EXCEPTION of those located on Placerita Canyon Road from Running Horse Lane to Pacy Street, Little Tujunga Canyon Road from the Wildlife Way Station to Sand Canyon Road & Placerita Canyon Road and Aqua Dulce Canyon Road from 1/4 mile south of the 14 Freeway to Soledad Canyon Road and Soledad Canyon Road 1 mile from Aqua Dulce Road in both directions. These three areas will remain closed. Large animals will be able to return as well." The statement notes that only residents will be allowed into the area, and they will have to provide identification. Officials also say there may be delays as people return and they suggest that residents who don't need to come back right away wait until later in the evening. An estimated 20,000 people are now under mandatory evacuation orders as high winds and extreme heat work against crews battling the Sand Fire burning in the bone-dry mountains north of Los Angeles. But in some parts of the fire's evacuation zones Monday, authorities advised residents to shelter in place, because at times trying to drive out to escape the flames was more dangerous. Those who evacuate can stay at various local shelters and area fairgrounds are housing pets. At a news conference, Los Angeles County Sheriff Jim McDonnell pleaded with the public to comply with evacuation orders when possible, noting that staying causes logistical challenges for crews on the ground. "To those who are still here, if we ask for a mandatory evacuation, there's a reason we're doing that, it's to protect all the public," McDonnell told KABC-TV. The wildfire that ignited Friday afternoon is burning in brush land in and around the Angeles National Forest where wildfires have been suppressed for decades. That's left a build-up of fuels which has been exacerbated by five years of historic drought. It's making for some unprecedented growth of the fire even for Southern California. Smoke from the blaze has prompted state regulators to issue air quality advisories for much of the L.A. Basin at least through Tuesday night. The cause of the Sand Fire remains under investigation. Hundreds of people have been evacuated from communities north of Los Angeles because a wildfire is burning out of control in dry, hot canyons. More than a dozen homes have already been destroyed and a man was found dead in a car inside the fire zone on Saturday. The man's home was one of those burned when the fire swept through Iron Canyon in Santa Clarita, Danielle Karson reports for NPR. The Los Angeles County Fire Department says more than 1,600 firefighters are working on the Sand Fire: digging trenches, clearing brush and working in triple-digit heat to protect homes and businesses. A department spokesman said on Twitter that more than 33,000 acres had been destroyed as of Sunday evening. Multiple helicopters have been battling the fire from the air, flying well into the night to keep the blaze from advancing toward buildings. Much of the area where the Sand Fire, named after Sand Canyon, is burning has not burned for decades. Los Angeles County Deputy Fire Chief John Tripp says the area was at high risk for a fast-moving fire. "One thing we've been talking about day after day is the stress of the vegetation; the drought," he said at a news conference on Sunday. "That fire came through like a freight train." "Firefighters had to cope with heavy winds, with gusts of up to 40 mph that pushed flames into remote pockets of the hilly region. The wind pattern that initially fed the blaze began to shift Sunday, with a sea breeze blowing toward the north for much of the afternoon, then reversing about 9 p.m. The erratic shift in winds pushed the fire northeast... where evacuations were ordered Sunday. "The weather service forecast temperatures of 96 to 100 degrees in the Santa Clarita Valley on Monday, with winds of 10 to 20 mph in the afternoon." California is entering its fifth year of a devastating drought. The southern part of the state, around Los Angeles and San Diego, has been hit worst. Another massive fire is tearing through more than 11,000 acres in the forests near Big Sur, on the central California coast. 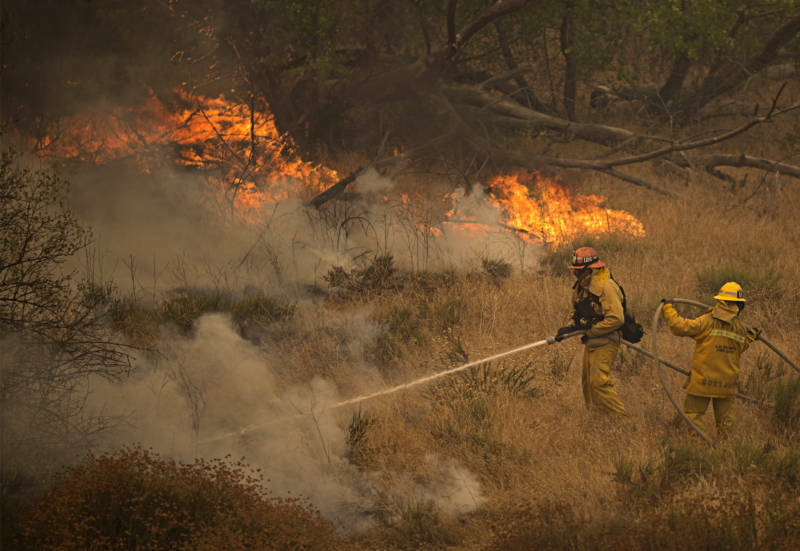 The Mercury News reports that fire has knocked out power to more than 1,000 people, and Cal Fire, the statewide agency responsible for coordinating wild land firefighting efforts, says the blaze is not contained and hundreds of residents in Monterey County have been evacuated. Cal Fire's latest wildfire map shows a total of 19 major fires burning across the state, 11 of which are not contained. The most serious fires are burning in the south.